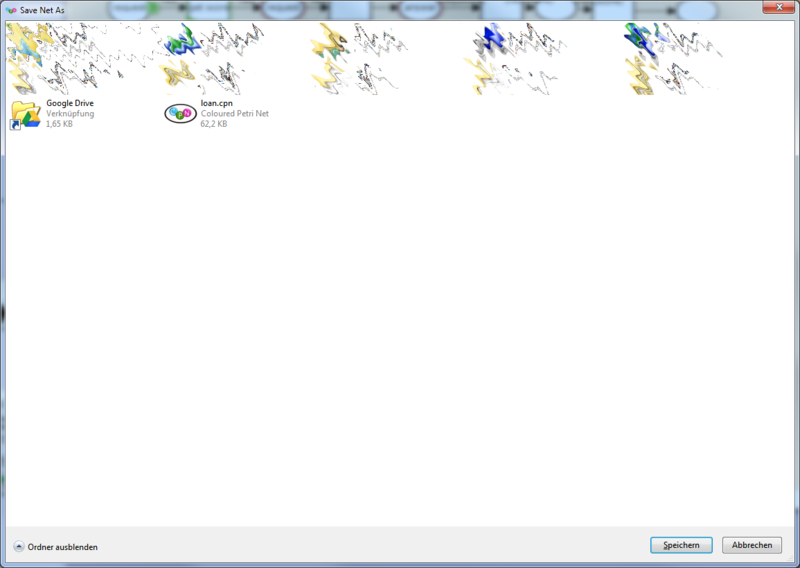 I am using CPN Tools 3.4.0 (latest stable today) with Windows 7 (64 bit). I created a new net and chose “Save net as”. I expected to show up a dialog allowing me to enter a file name (because the net was new). Instead a dialog windows appeared, where I only could dive into folders (not even back), and especially there was no field for entering a file name (please see attached screen shot). I cannot reproduce this – I get this dialog: http://dl.dropbox.com/u/267240/Image%20Dump/Screen%20Shot%202012-11-07%20at%2011.59.37.png – maybe the arrow doohickey at the bottom gives you more options? Funny thing, today I cannot reproduce the bug either. The arrow doohickey did not change anything yesterday and also subsequent tries to save the file did not succeed. Today I get a decent “Save as” dialog. So for now, you may close this bug. If I am able to reproduce the situation, I will let you know. Reporter cannot reproduce problem anymore either.